Insurance: Adequate and valid travel insurance is compulsory for all Premium travellers and it is a condition of accepting your booking that you agree you will have obtained adequate and valid travel insurance for your booking by the date of departure. 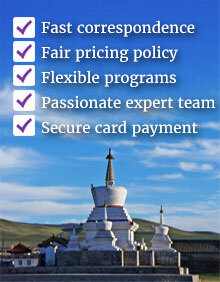 To make a booking you can contact us in several ways: directly via our website or www.mongoliatravelmarket.com (‘Website’), or by email to info@mongoliatravelmarket.com or to the direct email of your corresponding Premium Travel specialist. The person making the booking (the ‘lead name’) must be 18 years old or over and possess the legal capacity and authority to make the booking and accepts these booking conditions on behalf of everyone in their party. Whether you book alone or as a group, we will only deal with the lead name in all subsequent correspondence, including changes, amendments and cancellations. The lead name is responsible for ensuring the accuracy of the personal details or any other information supplied in respect of yourself and any other person travelling on the booking and for passing on any information regarding the booking or any changes made in relation thereto, to all persons travelling on such booking, including but not limited to information on schedule changes or copies of booking confirmations. All prices we advertise are accurate at the date published/offered, but we reserve the right to change any of those prices from time to time. Prices include a cost for fuel that was estimated at the date of this publication. Changes in transportation costs, including without limitation the cost of fuel, domestic flights, and exchange rates mean that the price of your travel arrangements may change after you have booked. However, there will be no change within 30 days of your departure. We will absorb and you will not be charged for any increase equivalent to 3-7% of the price of your travel arrangements. Should there be any change or cancelling in your booking please notify us in writing at least 31 days before departure (60 days for Naadam Festival holidays). 30 days or less before departure date (or no show up): 100% of the tour cost. We reserve the right to cancel your booking or change any of the facilities, services or prices described on our website or offered by a Premium Travel specialist. We will endeavour to advise you of any changes known at the time of booking. We plan the arrangements for your tour many months in advance and may occasionally have to make changes, most of which are minor. Domestic flight timings and carriers shown in offer are for guidance only and are subject to change. Your Confirmation Invoice will show the latest planned timings. Your actual flight timings will be shown on your final tour itinerary, which will be sent some 2-3 weeks prior to the tour start date. A change of carrier will not be considered as a change. (c) cancelling your tour, in which case you shall receive a full refund of all monies paid. We may also have to cancel your joined tour (set departure tour advertised on our website) arrangements. Operation of this kind of tours is dependent on a minimum number of persons booking the tour. If that number is not achieved, we reserve the right to cancel the tour. However we will not cancel your tour less than 4 weeks before the scheduled start date except for reasons of force majeure (as defined below) or failure on your part to pay the deposit and/or final balance, or any other reason beyond our control. Where we cancel your booking where you are not in breach of these booking conditions and other than for reasons of force majeure, we will offer you either a refund of the monies received by us in respect of the booking, or offer you, if available, a replacement holiday from us of equivalent or similar standard and price (at the date of the change). Our obligations, and those of our suppliers providing any service or facility included in your holiday, are to take reasonable skill and care to arrange for the provision of such services and facilities. You must show that reasonable skill and care has not been used if you wish to make any claim. Standards of, for example, safety, hygiene and quality vary throughout the transport and destinations that your holiday in Mongolia may involve. Sometimes these standards will be lower than those which would be expected in the western standards. The suppliers of the services and facilities included in your holiday should comply with local standards where they are provided. If you purchase any optional activities that are not part of your pre-booked itinerary, the contract for the provision of that activity will be between you and the activity provider. The decision to partake in any such activity is entirely at your own discretion and risk. If you do have any complaint about, or problem with, any optional activity purchased overseas your claim should be directed to the activity provider and not to us. Please be assured that our our tour staff will always do the utmost to ensure your safety and well-being when on tour. On certain tours (such as horse trekking, trekking, mountaineering etc) on which you are asked to sign an ‘Acceptance of Risk’ form prior to accepting your participation on the tour. The purpose of the form is to make you aware of the risks and dangers involved with travelling in these areas, and for you to agree that the service provider and the Company shall not be responsible for any claims made by you for incidents arising due to circumstances outside the service provider’s and the Company’s reasonable control. If you have a complaint about your arrangements while on the tour, you must immediately notify your tour guide and the relevant supplier of the service. If you are not happy with their action in response please follow this up within 15 days of your return home by emailing us to info@mongoliatravelmarket.com. We will acknowledge your written notification within 7 days and aim to provide a full response within 28 days. We can usually sort out any complaints you may have. Whilst we are able to provide basic advice to clients regarding passports and visa requirements, you should check with the Mongolian embassy or consulate for the exact requirements for your chosen tour and date of travel. It is your responsibility to ensure that you have the correct passport and visas to gain access to Mongolia for your holiday with us. If you fail to do so, we have no liability to you for any cost, loss or damage which you suffer, nor will we refund you the cost of any unused portion of your travel arrangements. The lead name is entirely responsible for ensuring that all members of the group have the correct and valid documentation for travel. We cannot accept responsibility for any failure to comply resulting in any costs or fines being incurred and we advise you to check with your passport office or the consulate in question if you have any queries. Please note that for some trips we need to request special permits (like border area travel permit for Altai Tavan Bogd national park, or the Taiga of the Northern Mongolia etc), and as such we will require your passport details & photocopy prior to accepting your booking. Furthermore, if you renew your passport after you have booked, you may be required to take your old passport with you to maintain the validity of the permit. We are able to advise on mandatory health requirements; however, it is your responsibility to ensure that you obtain proper and detailed medical advice at least two months prior to travel for the latest health requirements, recommendations for Mongolia by your local medical doctors and any costs. Clients with existing medical problems, and pregnant women should check requirements with their general practitioner. On the tours operated by Premium Travel Mongolia it is necessary that you abide by the authority of the tour guide, who represents the Company. If you commit any illegal act when on the holiday or if in our reasonable opinion or the reasonable opinion of the tour guide or another person in authority your behaviour is disruptive, threatening or abusive, causes unnecessary inconvenience or is causing or likely to cause damage to property, danger, distress or upset, disturbance or annoyance to others or puts any other traveller or our staff in any risk or danger, on the telephone, in writing or in person, we may terminate your travel arrangements without any liability on our part. If you are affected by any condition, medical or otherwise, that might affect your or other people’s enjoyment of the holiday, you must advise us of this at the time of booking. For the purpose of this section, reference to “you” or “your” includes any person in your party. No unaccompanied children (under 16 years of age) can be accepted however (a) minors aged between 0-15 years may accompany their parents on tours and (b) older teenagers may be allowed to join group tours provided they are accompanied by a parent or guardian who accepts full responsibility for them.